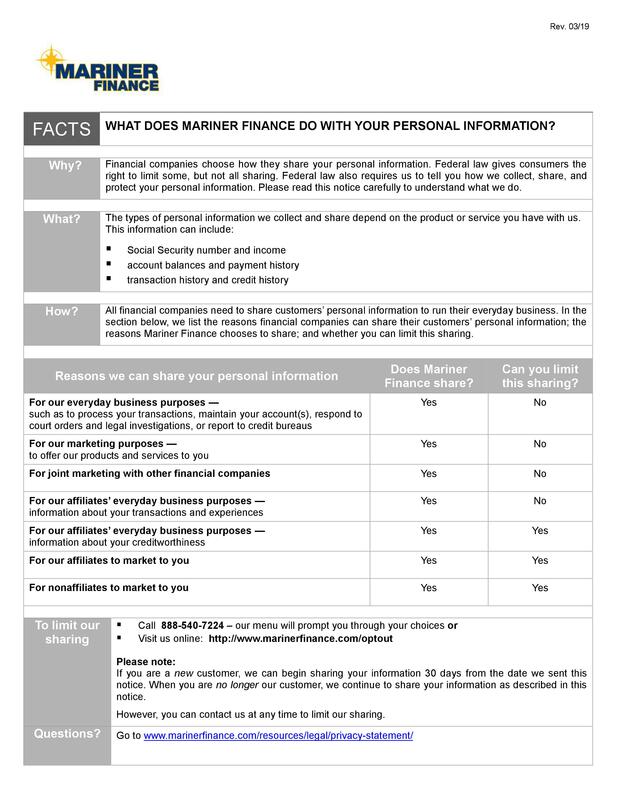 MARINER FINANCE, LLC , ITS PARENT COMPANIES AND THEIR RESPECTIVE SUBSIDIARIES AND AFFILIATED COMPANIES (COLLECTIVELY, “MARINER”) VALUE THE PROTECTION OF INDIVIDUAL PRIVACY. 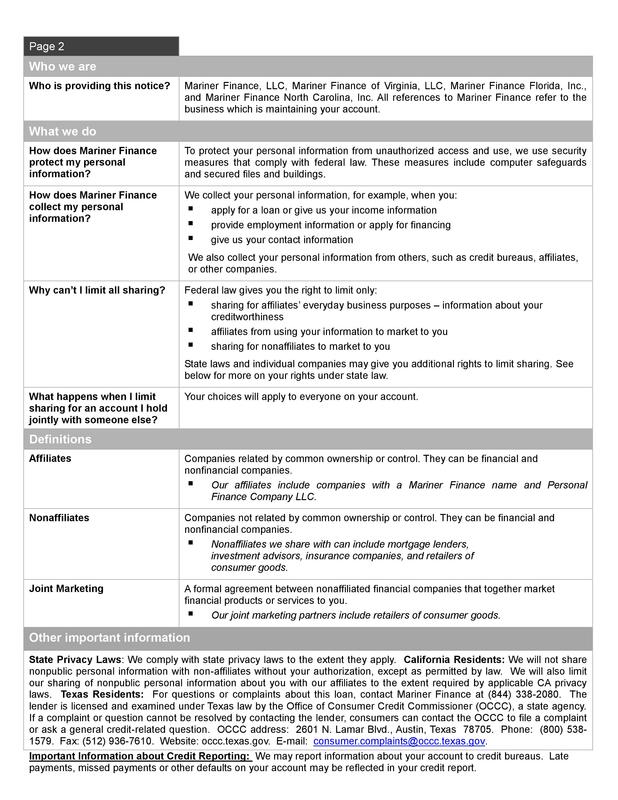 THIS PRIVACY STATEMENT DESCRIBES WHAT INFORMATION MARINER COLLECTS THROUGH ITS WEBSITES, INCLUDING WWW.MARINERFINANCE.COM (COLLECTIVELY, THE “SITE”), HOW IT USES THE INFORMATION AND WITH WHOM IT MAY BE SHARED. THIS PRIVACY STATEMENT APPLIES ONLY TO INFORMATION COLLECTED THROUGH THIS SITE. The Site does not collect personally identifiable information from you unless you voluntarily provide it through various forms and in various places on the Site, including by entering it via an online form, over the phone, or via any other means through which you interact with our services. Personally identifiable information may include your name, address, telephone number, mobile number, email address, and Social Security Number. You are responsible for ensuring that any personally identifiable information you provide is truthful, accurate and up to date. We will collect and store personal information you decide to provide to us for our records but we are not liable to you if the information you provide is not accurate. You agree that we may use any of your personal information that you provide to us to communicate with you. Additionally, if you apply for a loan on the Site, you must truthfully and accurately complete our online application which includes your provision of personally identifiable information. Accurate, up-to-date information is necessary to view your credit history and otherwise process your application and to contact you. Mariner takes various precautions to safeguard your personal information against loss, theft and misuse as well as unauthorized access, disclosure, alteration and destruction. For example, all online applications are encrypted to maintain the security of your information. Once received, your personal information is stored in the United States in accordance with United States law. Third parties may also collect personally identifiable information about your online activities through the Site in order to assist Mariner in offering its services and products, marketing, and administration of the same. The Site may gather non-personal information about you depending on how your browser is configured. That information may include the Internet Protocol (IP) address(es) used to access the Site, the number of times you visit the Site, the time and length of the visit, the operating system and browser type used to access the Site, your screen resolution, the particular web pages viewed right before and while visiting the Site, how long you remain on specific pages, your navigation patterns, where you go upon leaving the Site, or similar details. Non-personal information collected as a result of your visit to the Site may be disclosed to third parties, but will not be associated with you personally. In other words, the Site may disclose that a unique user accessed the Site a particular number of times and spent specific amounts of time on different pages, but we will not disclose the identity of that user (and most likely would have no way of identifying who that user was unless the user voluntarily identified him or herself to us). To prevent unauthorized access to your personal data, maintain data accuracy and integrity, and ensure the correct use of information, Mariner follows generally accepted industry standards to protect the personal information submitted to us, both during transmission and once we receive it. No method of transmission over the Internet, or method of electronic storage, is 100% secure, however. Therefore, while we strive to use commercially acceptable means to protect your personal information, we cannot guarantee its absolute security. You may request access to and/or to change your personally identifiable information by contacting us at the following phone number or postal address: 877-310-2373, Mariner Finance, LLC, 8211 Town Center Drive, Baltimore, MD 21236. If you currently have an account with Mariner, you may log into the Customer Account Center to review and/or edit your personal information. Mariner reserves the right at any time and from time to time to modify this Privacy Statement with or without notice. You will be bound by the modifications if you use the Site after a modification has been made. You agree that Mariner shall not be liable to you or to any third party in any way as a result of any such modification. If you do not agree to any changes or terms, you should discontinue your use of the Site. If you have any questions or comments regarding this Privacy Statement, please contact Customer Service at 877-310-2373.